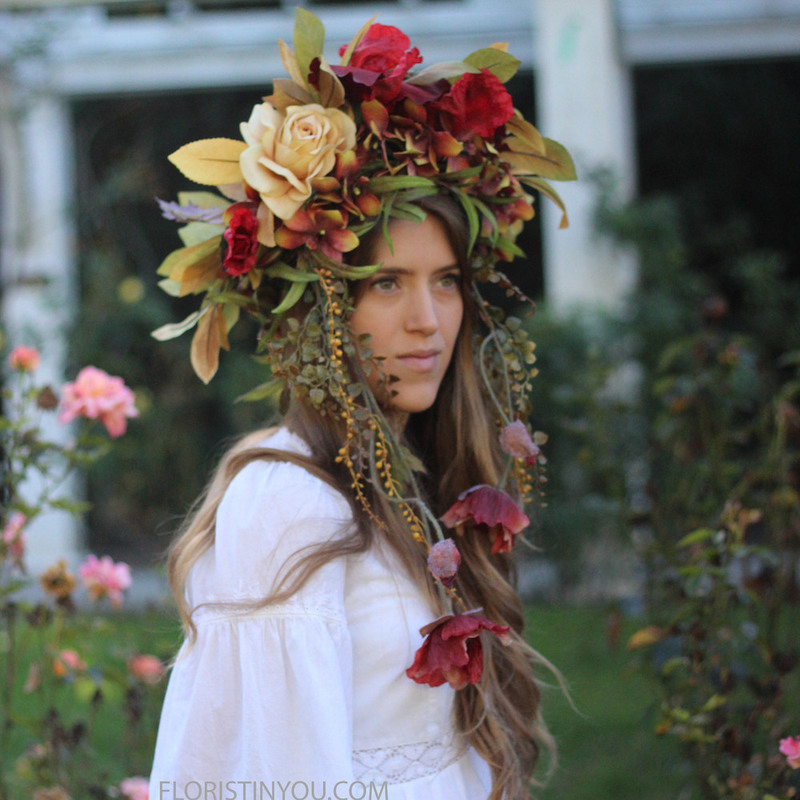 A special thank you to the lovely Taylor Olson for modeling this flower crown and the talented Cody Owens for the photography. Let your imagination run wild. 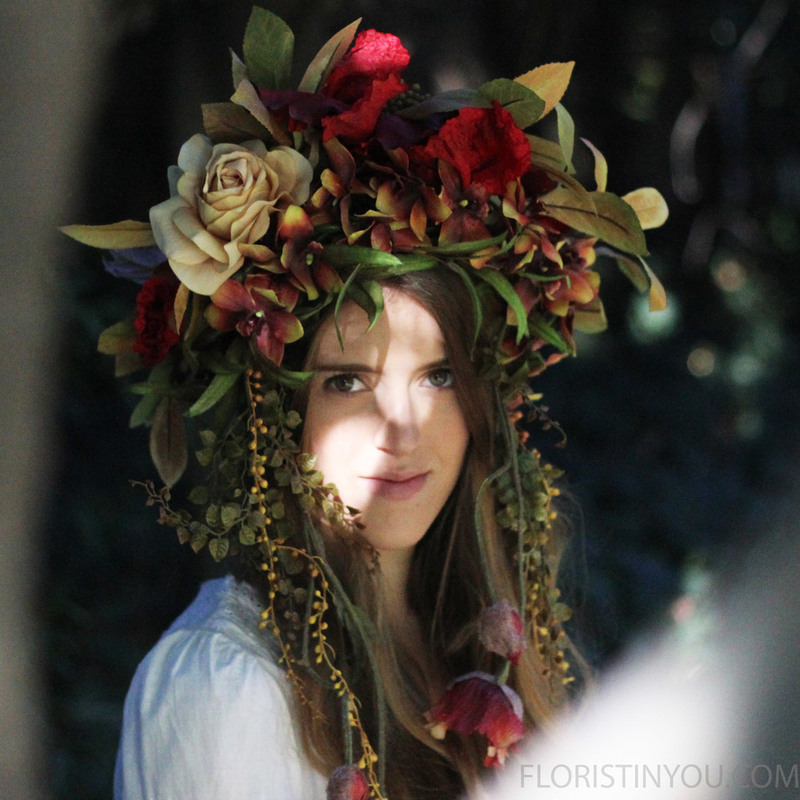 Think fantasy, midsummer night's dream, faeries and flowers. Now that you have the imagery, we can go to work. Begin by wrapping the wire at the widest part of the forehead around your head or the head of the person you are making this for. Now loosen it by a half an inch, making sure all three wires are uniform. Leave about 2.5 inches on both ends of the wire, and then cut the wire. You will now layer the flowers onto this base by weaving long pieces of wire (about 40 inches) long around the base and the flower stems. If you are ready for a little magic, let's begin. Wrap wire around head 3 times, then loosen 1/2 inch. Leave extra 2.5 inches on each end, cut and twist the two ends together. 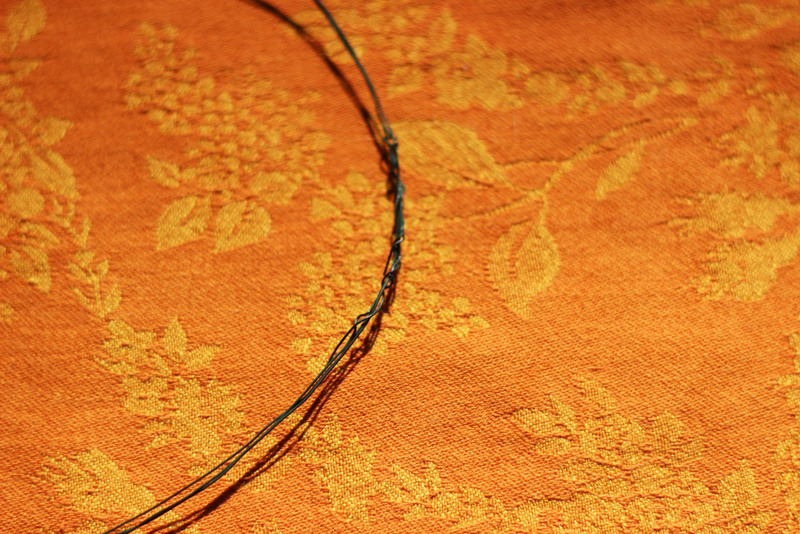 Wrap the ends around the wire oval so there are no sharp edges. Take a 40 inch long wire & twist around points of eucalyptus stem and wire frame. Like so. This is the first layer on your crown. Cut stem after last bloom. Use wire to start attaching on left side. 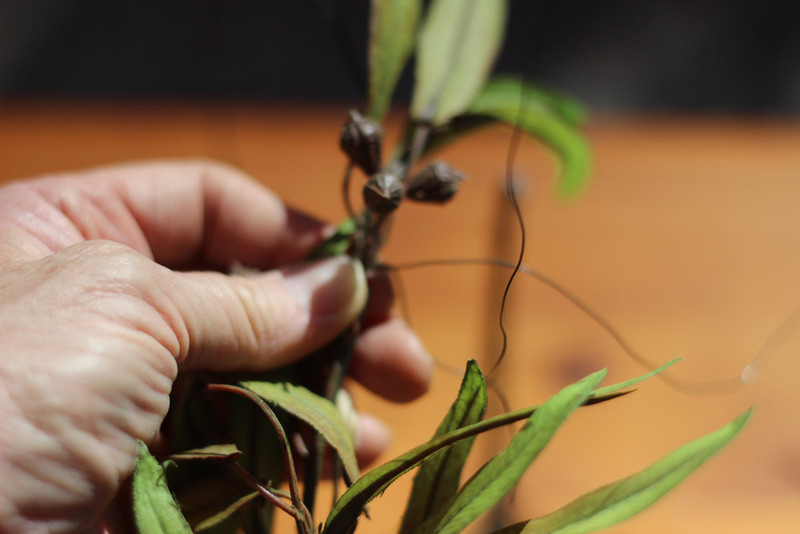 Wire orchid stem to wire frame at points about 2 - 3 inches apart. Wire next orchid stem to fill in the gap. Wire orchid ring onto eucalyptus ring using another 40 inch wire. Be careful and wire only the stems! Don't wire up the leaves. Cut bearded iris about 9 inches long. Cut rose the same. Wire rose onto left front with bearded iris center and left front. Wire golden leaves on front left, front right, back left and back right. Wire maidenhair on each side of head coming down over temple. Wire poppy straight down each side by maidenhair fern. Should extend to about collar bone. Make 1 side 2 inches shorter. 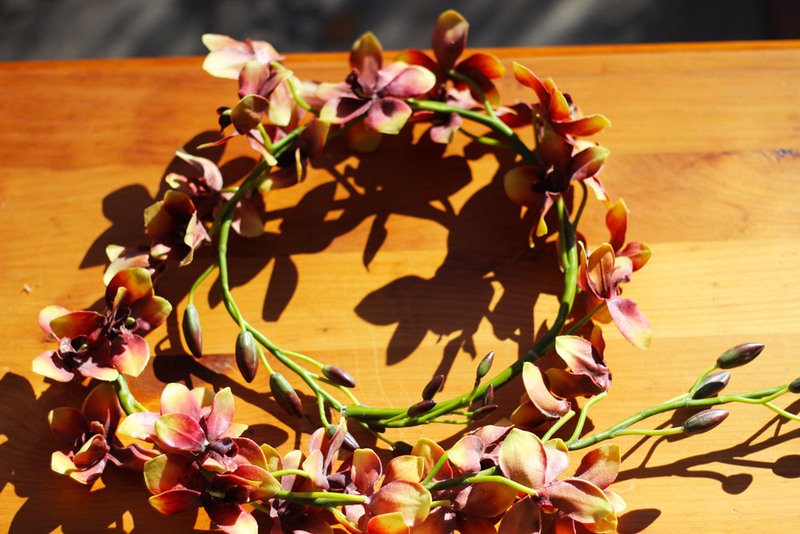 Your faerie crown is complete. You know, sometimes you might see faeries in the early morning rays. Or in the filtered light at the end of a path. 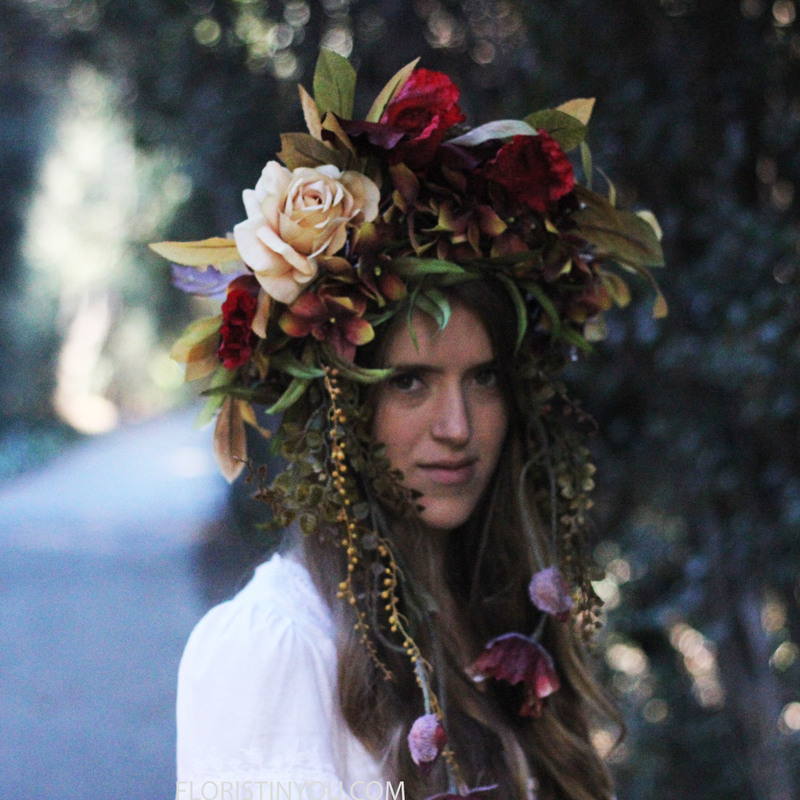 Faeries are hiding in the woods you know. Sometimes you can see them through the trees. Timeless. Or in a midsummer night's dream.